NASA's Solar Dynamics Observatory (SDO) scientists used their computer models to generate a view of the Sun's magnetic field on August 10, 2018. The bright active region right at the central area of the Sun clearly shows a concentration of field lines, as well as the small active region at the Sun's right edge, but to a lesser extent. 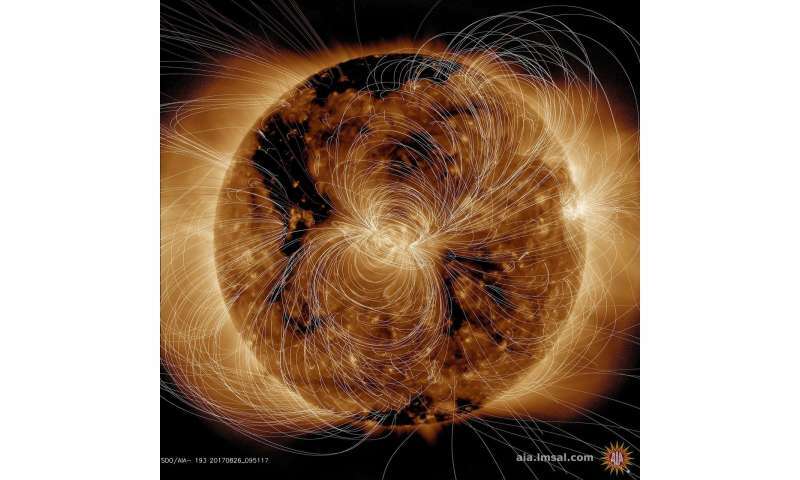 Magnetism drives the dynamic activity near the Sun's surface. These fields are generated by the solar wind? By the sun spinning does it generate another mag field? Is this a good example of how hot objects loose their coherent magnetic field by misaligned temperature generated ad hoc domains making the overall magnetic field incoherent? Once the heat breaches the shell of the object the solar wind starts flowing and it disrupts the overall magnetic field. Earths core is hot and spins but the earth still has a coherent magnetic field is this because the heat hasn't penetrated the crust?